By Default all Pay-Per-View videos and playlists are set to a Default Order Confirmation Email from us. 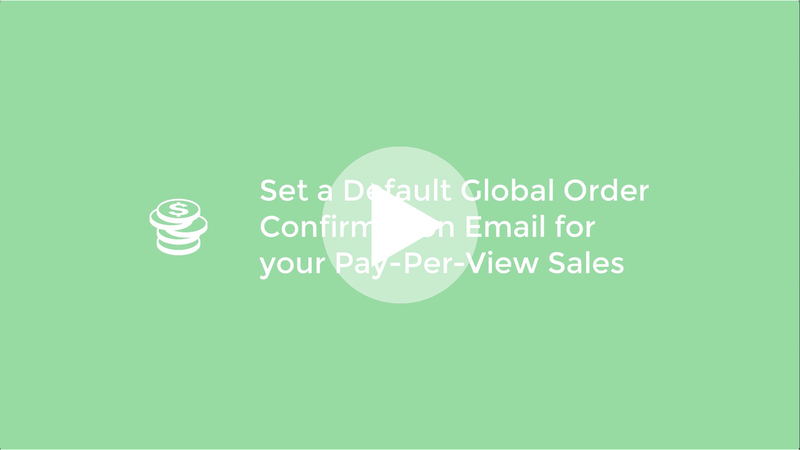 Once you have created your own Custom Order Confirmation Email template, you will be able to change the Default Global Confirmation email for all your Videos and Playlists. If you want to check out some Pay-Per-View Demos and extra information please visit our Pay-Per-View information page. You can change this by going to to ⚙️ Settings > Pay-Per-View 🔽 > Order Confirmation Emails. Here you will see a list of your current Order Conformation Emails as well as the default Default Global Order Confirmation Email. The 🏠 Home Icon allows you to change the Default Order Conformation Email package applied to all videos and playlists. A Dark Home Icon next to the Pay-Per-View Package name indicates which package is currently active as your Order Default Conformation Emails. To choose a different Order Conformation Email as default hover over your desired custom email name and click on the 🏠 Home Icon. You will be presented with a pop up information box asking you if you want to change the current Default Order Conformation Email to the newly chosen one. You have now changed the Default Order Conformation Email settings to your desired Email Template.